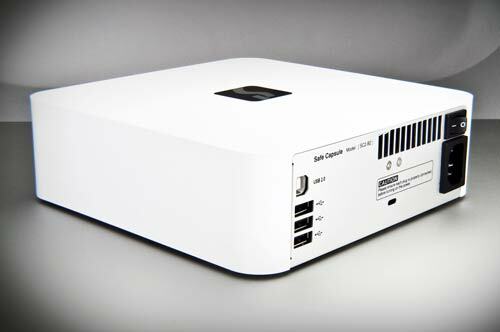 Stardom's Safe Capsule is a product that extends your Apple Time Capsule's storage capacity or adds storage capacity to your Airport Extreme Base Station. I connected it to our AirPort Extreme Base Station to see how easy it was to deem it my Time Machine receptacle. I simply plugged the Safe Capsule into the Base Station and powered it up. Then when I went to the Time Machine preferences, I was able to "see" it and choose it as the target. Being a performance scientist, I was curious how long it would take to backup the user files on my MacBook Pro. The initial backup to the Safe Capsule (via 802.11n) of 9GB (463K items) took 55 minutes. So then the obvious question is, "How long would it take to do the initial backup if the Safe Capsule is connected directly to the MacBook Pro's USB port?" Time Machine utility was used for each backup. The Seagate Barracuda 7200.12 1TB drives used were reformatted between each run. The first graph includes the time it took Time Machine to calculate changes and index the backup set. In the second graph, I subtracted that time (which was 6 minutes for all four scenarios). As you can see from the graph, direct connect is about 10 times faster than using the AirPort wireless network (WiFi 802.11n). In other words, if you are in a big fat hurry, you can connect the Safe Capsule directly to your Mac's USB 2.0 port. Now, having shared those performance stats, I concede that you may not care how fast the backup takes as long as it gets done automatically, safely, and conveniently. The wireless setup of the Safe Capsule is not only automatic, safe, and convenient, but can be used by more than one Mac on the network (aka versatile). If you were using your Time Capsule or AirPort Extreme Base Station's USB 2.0 port for a shared printer, will you lose that option with the Safe Capsule connected in its place? No. The Safe Capsule has three USB 2.0 ports. It is, in effect, a USB hub that connects up to three USB devices including a shared printer. The Safe Capsule is shipped empty. You get to choose your own storage devices and easily install them in the unit. A good choice would be a "green" low power, cool running, reliable drive like the 2TB Western Digital Caviar Green or Seagate Barracuda LP. But any SATA 3.5 drives will work, though I recommend a matching pair of drives (same brand, model number and capacity). The Safe Capsule has a built-in power supply, so you don't need to fiddle with a power "brick." It also includes a fan to keep the power supply and drives cool, though I wish it was a little quieter. Finally, starting today, there is a special pricing promotion to introduce the Stardom Safe Capsule. Purchase a Safe Capsule from any authorized dealer and receive a $20 rebate. Think about how you would feel if you lost all the user files on your Mac. Then order the Safe Capsule. When you make a purchase at the Apple Online Store (USA), please CLICK THIS LINK. It's a great way to support Bare Feats since we earn a commission on each click-through that results in a sale.